Simple Balance 2.0 wordpress theme is a beautiful and minimalistic WP design. This is a 3 column wordpress theme which is mostly white except for the blue fade-out on top of the page. The pages links are in the header aswell as blog’s title and tagline. The search function is also in the header (top right corner). All this is followed by a 468 x 60 banner ad place holder. 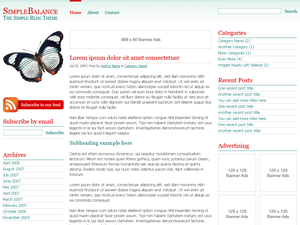 Simple Balance wordpress template was designed by blogsessive.com. Sidebars are located on both sides of the main content area. Both sidebars are wordpress widgets compliant. The right sidebar also holds two 124 x 125 banner ad placeholders. There is an image of a butterfly just above the left sidebar.